And we couldn’t be happier here at From the Hip Video! 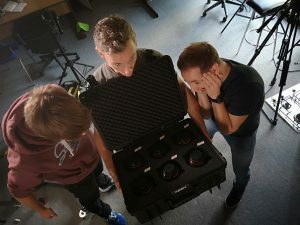 Our investment into Cine Lenses and a Drone over the summer doesn’t only mean our crew are in awe constantly, it also opens up a whole host of filming possibilities and benefits for us and our clients. 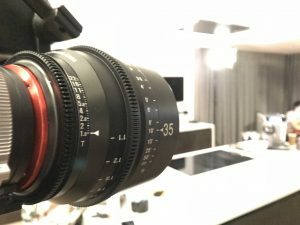 Cine Lenses are a camera crew’s dream! Built for cinema, the Cine Lenses provide more accurate and smoother focus, better maintenance of exposure throughout the film and more precise transitions between focal distances, making filming moving objects or people much more defined. Excitingly, this means that, creatively, we can approach video content storyboarding more challengingly. We can work with our clients to consider different ways to approach their video content, suggesting filming possibilities which they possibly wouldn’t have considered before. This means we can work with our clients to ensure their video ROI works as hard as it can and we can push our creative minds to the limit! As Cine Lenses are built for cinema, the end result and quality is 4k broadcast ready. This means that from one shoot, and with some up front planning, the high quality 4k broadcast video can be edited for all TV, social, and video content requirements, making the creative and production process much more affordable. It also means all video production can be housed under one roof, removing our clients brand consistency headache, by providing better control over message and finish. Cine Lenses capability to shoot under difficult lighting conditions gives us much better control to manage the unpredictability of weather and other ambient conditions. This helps take some of the stress out of contingency planning for us, and you, and means deadlines are much less likely to be jeopardised by mother nature. The natural thought when you hear the word Drone is aerial shots. And, with little set up, our Drone will indeed allow our crew to capture stunning HD quality aerial shots. However, we are hoping our Drone will more come into its own for tight space filming, achieving hard to reach angles for our clients that simply a person couldn’t get, for example detailing the intricacies of high rise machinery. We are just counting down the days for our licences to arrive to get started! Is it any wonder our crew and clients are happy! If you’d like to talk more about how our new kit can help deliver your video content plan, please do get in touch at [email protected]. We’re currently taking bookings for Christmas video content!